As I sat in the hot sun drinking tea and surrounded by a like-minded group at the Woodcutter’s Hut, I took a moment just to exhale. Christmas prep is in full swing and most people I know are either loving every minute (under 10s), running around madly trying to get organised or travelling across the globe to see friends and family. But last Thursday, a group of us stepped away for a few hours to soak up some peace in the hills near Falciano del Massico in Campania. 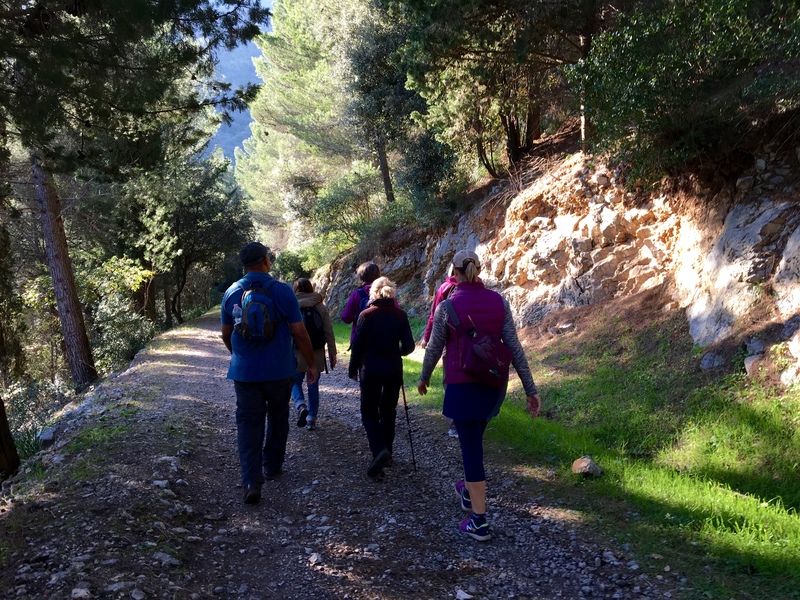 It was a sweet moment for me as this was the first official ‘Hiking Campania’ group walk. I’ve taken groups out for the British community here in Naples and of course gatherings of friends, but this was the first public walk and so this moment felt..pretty special. Plus, I could not have asked for a more beautiful, blue-sky day, or a more interesting and positive group of people to share it with. Half of us met in Lago Patria that morning to car-share and the rest got stuck in with the Sat Nav to navigate some very narrow streets and meet at the trailhead in the woods above Falciano. There were 15 of us – a mix of all ages, nationalities and experience and even some tiny babies (I think the youngest was just 4 months old – hats off to their adventurous Moms – ladies after my own heart!). 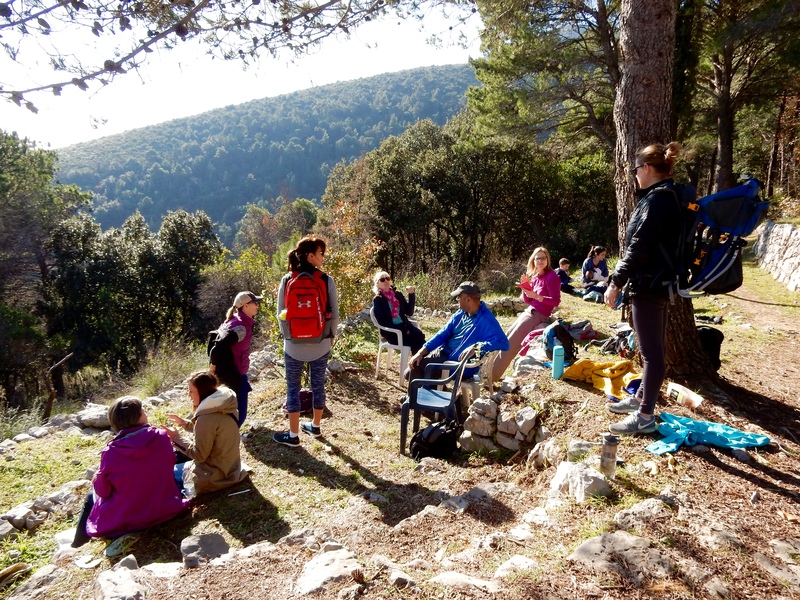 After we got our boots and rucksacks on I explained a little about the hike, shared some muffins (walking is not possible without cake first, right!?) and set off. The trail is wide and gently sloping and we meandered beneath the forest canopy through crisp morning air. After a short way there’s a detour to a viewpoint so we peeled left and walked steeply uphill, wriggling under a fallen tree. The path was soft from a thick covering of pine needles and dotted with spiky red berries from the Strawberry tree which lent a Christmasy feel. Wild boar had broken the edges in long furrows on their early morning search for roots and morsels. Soon, the Campania-Felix plain came into view below the treeline, revealing an Autumn patchwork of ploughed fields, sparse fruit trees and green windbreak plantations, with the Volturno river cutting a glassy swathe down the middle. On the horizon, the Tifantini mountains formed an undulating silhouette in the mist. When you live in Napoli, one of the most densly populated cities on earth, it’s easy to feel hemmed in, to believe there is no green space or escape – but it’s not true – in half an hour you can be surrounded by nature and clean air. I showed the group several other hill walks on our doorstep, as well as a glimpse of the ‘Woodcutter’s Hut’ in the next valley – our destination for the day. This was an introductory hike so we took things slowly, allowing the kids to stop and explore, lift stones, pick flowers and chase each other with sticks. Just as the sun really came up and through the trees, we reached the hut. It’s a ramshackle metal structure with a broken table outside. Inside there’s a fireplace and makeshift bed; used by the forestry workers during the summer months. There are several terraces with glorious views and it’s a great place for a picnic. We found chairs or flat patches to lay a blanket and hung out for a while in the sun; chatting, sharing food and making friends. Beyond the hut there is a longer circuit, so the group decided to split here for a while. Some Moms stayed at the hut nursing and playing with little ones in the sun and 7 of us headed back to the trail for a loop off the main track, up a valley and back to the hut. This route has one technical section which involves clambering around a fallen tree and then half walking, half sliding down a steep valley. It was a little challenging and everyone got involved supporting each other down the tricky slope (thank you to Nov who helped on the final step). We weren’t expecting to do this but we had fun… and I caught a glimpse of what I think will become a very cool and adventurous group in the months to ahead. Thank you to everyone who came along – your stories and enthusiasm were amazing and I can’t wait for the next meet up in January. If you’d like to come along, register your interest on Facebook here: Monte Virgo & Caserta Vecchia, Wed 11th January 2017.